Well it was 21 when we started and warmed up to a balmy 30 degrees at the end. But it was beautiful, sunny and not too windy. We only saw a couple people near Camp Hoover which was one of the reasons we had so many unusual animal sightings. The first one was when Wanda Hamlin spotted the majestic bald eagle cruzing just over head as the AT hit the first junction and we headed on to the Laurel Prong trail. It came up on us so fast, that none of us were able to react fast enough to snap a photo! Then later, as some of you know there are many large boulders along the Laurel Prong trail and it was here that Taylor Putney spotted, of all things, an albino deer! Dave Borszich our resident professional photographer was off looking for arrow heads for his latest art project and didn’t see it, so couldn’t take a picture! The rest of us were so far ahead that we only heard about it and had to take Taylor’s word for it. Down near the camp we ventured up in to the Five tent area where there was a large fireplace and stone steps/foundation in good repair. When Kelly had everyone lined up taking the first group photo, a large barn owl flew in and landed on a tree behind everyone. 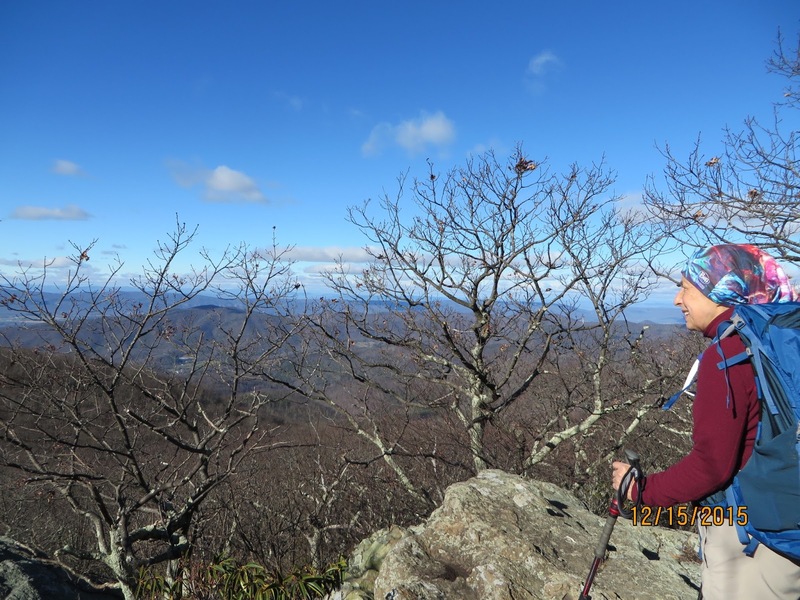 Of course, given the choice between taking a photo of owl or her own little flock of chicky’s, Kelly did what any good hike leader would do and you can see from the photo which picture was taken. We headed down to the camp and the newlyweds Dan Ralston and Jeanne Densmore who sped ahead and got there first, told us that when they came up to the porch to eat, they scared off a rather large black bear who was sunning himself on the porch! Do you think they got a photo? No they didn’t. Even having recently attended a bear seminar and knowing black bears don’t attack humans, they only turned and ran! Of course the bear was gone when the rest of us got there. After lunch we walked up the Mill Prong trail where we saw a few trout swimming around. We headed back on the AT to a great overlook where Michael Seth had the most amazing animal spotting of the day when he saw a snow leopard (editor's note: snow leopards are native to the mountain ranges of Central and South Asia) sitting on the rocks. Yes, I was able to just get a photo of Michael and Taylor pointing to it, but for some reason it did not show up on the picture!! Now no one is going to believe us! Well we don’t care, we had the best time and can’t wait to go out again to enjoy all the splendor that can be found in this beautiful state park we are so lucky to have in our back yard! Distance: 8.39 miles (this includes the tent camp, the overlook, and the walk over the bridge at the camp). 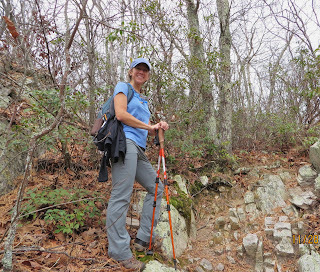 Hike leader Barbara Martin was joined by Claire Cline for a very enjoyable hike along the Appalachian Trail from the Pocosin Fire Road to Milam Gap. The day started out cloudy and cold, but to our delight soon turned warmer with a brilliant blue sky. 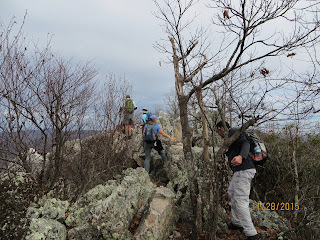 We made a short detour on the Bear Fence Mountain Loop Trail and were treated with beautiful views and some amazing rock outcroppings. 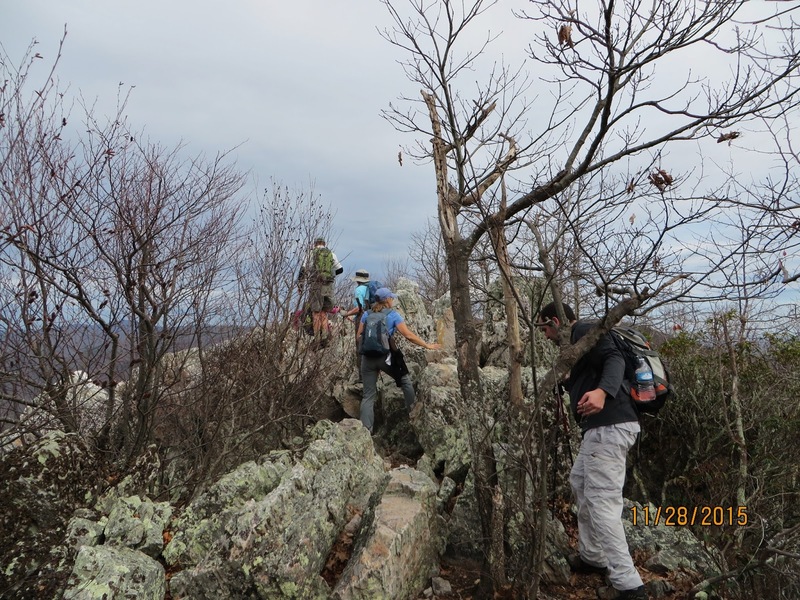 After a quick lunch on the trail we continued on the final ascent of the day, up Hazeltop Mountain and completed our hike at Milam Gap. A wonderful day with a great hiking companion. It was a beautiful summer day in the 80s BUT it was the middle of December! 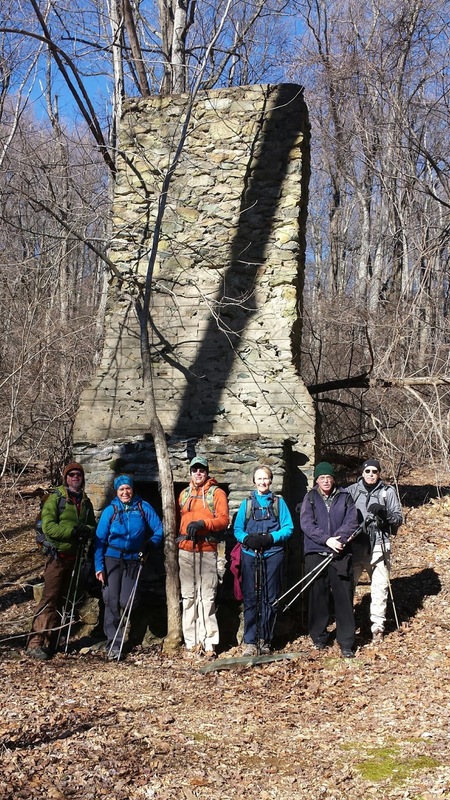 Eight determined hikers setting out to climb one of the steepest hikes in our area and to do it quickly enough for some folks to get back to town for holiday festivities. 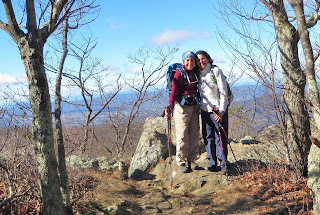 We did make the first half of the hike, the first 4 miles and the 3,050’ elevation gain climb to the top in 2 ½ hours! 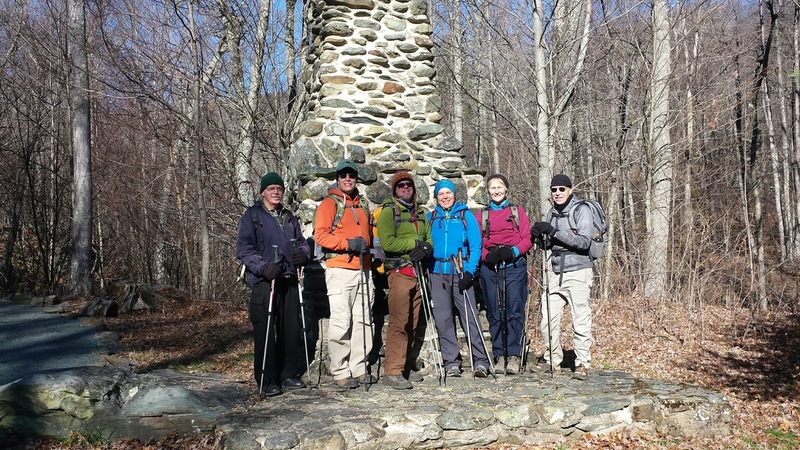 Dan Ralston led Jeanne Densmore, Heather Lambert, Pete Fink, Lindsay Brown, Dave Abdallah, Chadwick Watter and Grace Niu on the hike. We had two new people join us: Heather Lambert and Chadwick Watters and I think we will see them again with us soon. 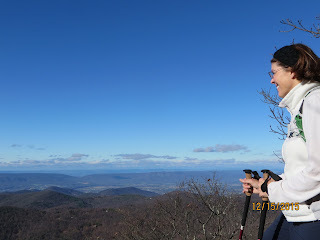 Everyone enjoyed the stunning views on the way up and we had lunch on the top with a very clear panoramic view of the Shenandoah Valley. A great hike enjoyed by all. By reserving 5 cabins at Lost River State Park, our core group of 13 set up headquarters for a weekend of group meals and hiking with new and former friends. Gathering for the weekend was: our organizer - Kelly O’Rourke, Barbara Martin, Dianne Anderson, Geoff Manning-Smith, Edna Baden, Carol Wise, Nancy Weiss, Jayne Mayne, Susanna and John Williams, Mark Trail, Bill Holman, and Iva Gillet. With a rent 2 nights - get one free policy, several of us extended the weekend into Monday. Our cabins had wonderful fireplaces and modern kitchens, with spacious decks in a wooded setting. With cozy chairs and plenty of food to share, there was time to rest and relax when we weren’t hiking. We all highly recommend this West Virginia State Park, just 1½ hours from Charlottesville. The cornerstone of our cabin/hiking weekend was either a long (11 miles) or short (4.5 miles) hike to Big Schloss. 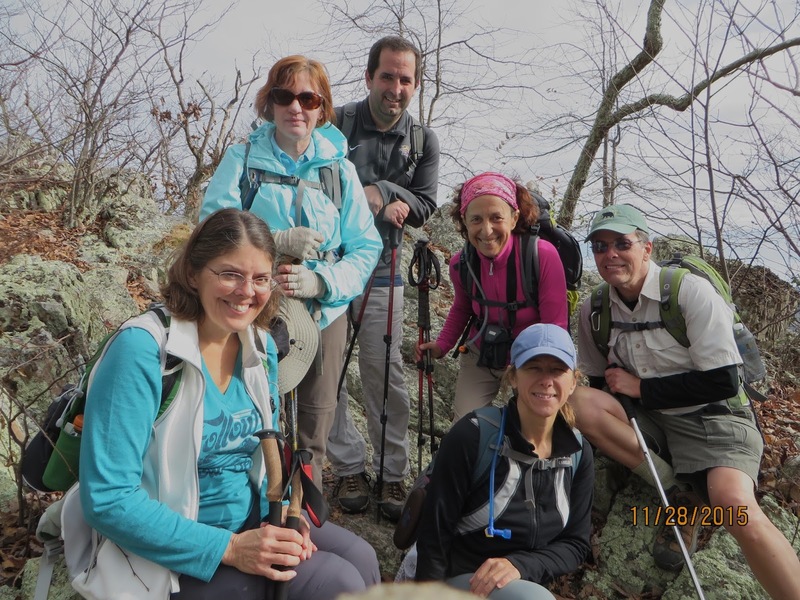 For the long hike, leader Michael Seth was joined by Charlottesville PATC hikers: Mark Trail, Barbara Martin, Kelly O’Rourke, John and Susanna Williams, and Iva Gillet. Also joining from other PATC clubs were Aida Salines, Scott McBane, Edna Baden, Jayne Mayne, Gina Kwak, Judy Smoot, Karen Brown, Valentine DiMilo and Beth Lipford. The weather was perfect - crisp and clear. Despite the hour drive from Lost River to Wolf Gap campground (a site for a future camping adventures!) it was worth the trip. 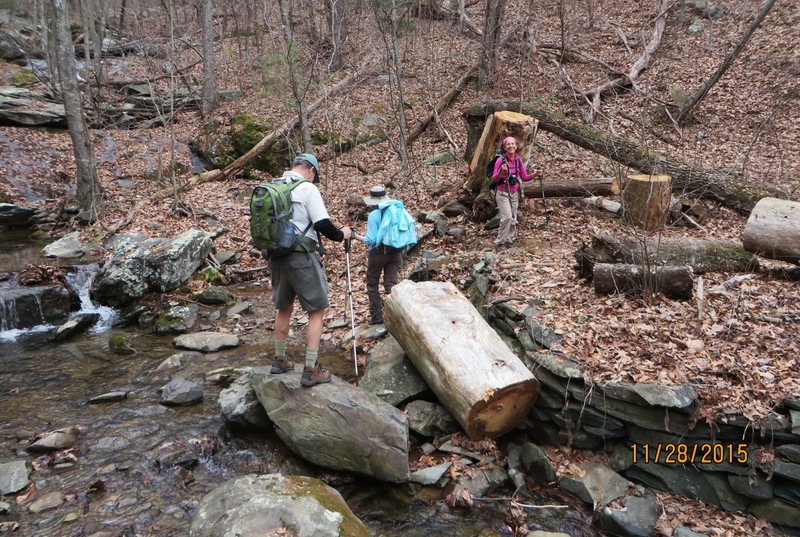 Long hikers started with a gradual ascent along a lovely trout stream, eventually passing the small, square, Sugar Knob cabin. 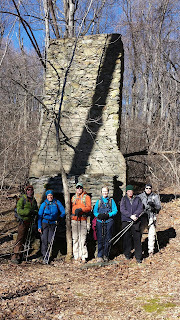 We enjoyed lunch along the Tuscarora Trail before continuing toward Big Schloss along the ridgeline. When we arrived at the intersection with the trail back to the cars at 3 PM, with Big Schloss still to come, several folks returned to the cars to make sure that they made their evening commitments. So 5 of us continued to the expanse of craggy Big Schloss. The view from Big Schloss was spectacular. The bridge constructed there is a marvel. The short hikers, led by Bill Holman, consisted of Geoff Manning-Smith, Nancy Weiss, Carol Wise, and Dianne Anderson. While both groups had intended to meet and lunch together, long hikers were much later, so the shorter hikers has already come and gone by the time we arrived, despite our 2 hour lag in start time. 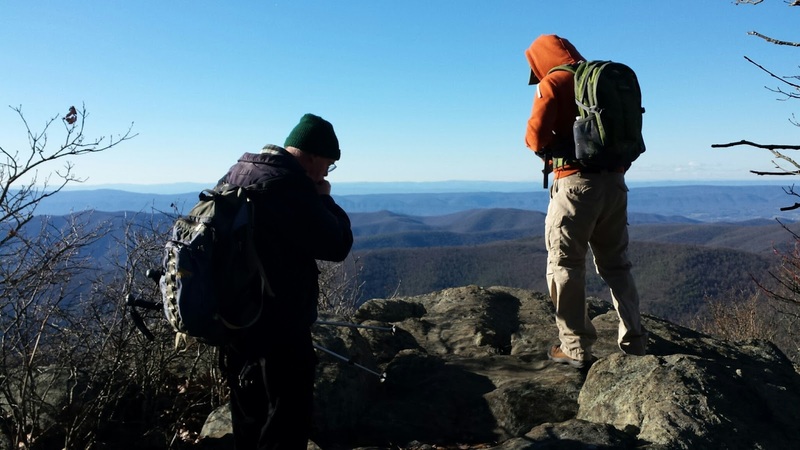 We all enjoyed the spectacle of natural beauty and expansive views. 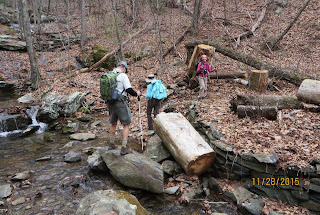 Long hikers were very happy that our carpool drivers, Michael and Jayne, had fetched the cars and moved them to Wolf Gap, so we did not have to return to the start. Saturday night dinner was a hearty spaghetti meal prepared by Barbara Martin with handmade meatballs and homemade sauce, salad and garlic bread. Combined with all the desserts that were brought to share, we were all well fed! 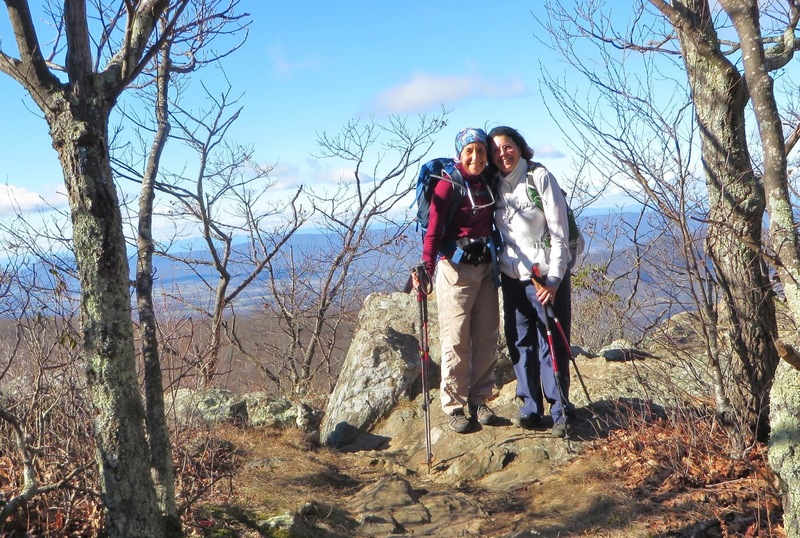 Sunday, Jayne Mayne led a long hike and Nancy Weiss led the short hike, both on the trails at Lost River. 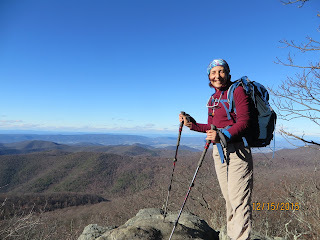 With many rock outcroppings, small shelters, campsites, horses on the trails, and distant views, we had another day which reminds us how fortunate we are to be able to hike in such an amazing part of the world. Pleasant temperatures and fall leaves enhanced our Sunday. It was fun to get to meet and talk with many other PATC members from nearby clubs. We have so much in common sharing our love of nature and being outside enjoying life to the fullest. Be in the moment! 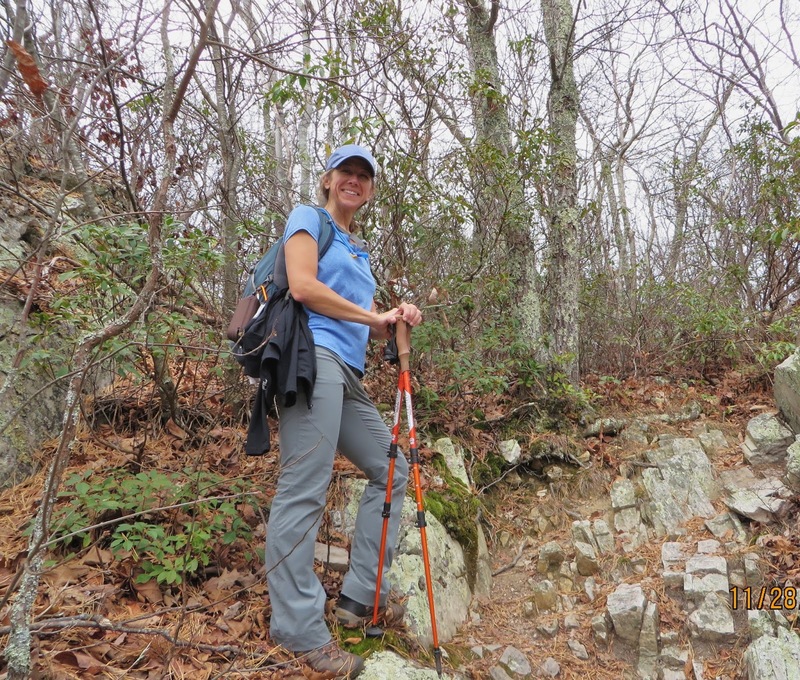 Barbara Martin led a hike on the Turk Mountain Loop, which included gorgeous views from Turk Mountain and walking beside the Moorman River. We had a first time PATC hiker, Taylor Putney and long time hiker Marian Styles and met Claire Cline, Kim Botcher and Patrick Cory at Jarman Gap. 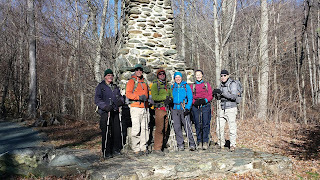 We proceeded to work off some turkey and pumpkin pie by climbing along the AT to the Turk Mountain Trail. 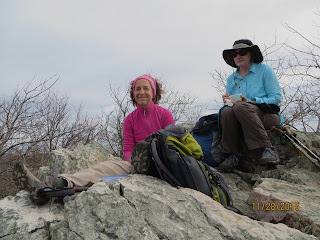 After a clambering over a few rocks we reached the summit of Turk Mountain for a relaxed lunch with home made cookies from Barbara. We wound our way back to Skyline Drive and took the Turk Branch Trail to the Moorman River fire road. Several stream crossings were worth it with pretty views and the soothing sounds of the river flowing over rocks.